Colonial Mist was designed to accompany the Corelle Dinnerware pattern of the same name. Colonial Mist was the last opal PYREX pattern ever designed before production ceased in 1986. Colonial Mist was designed to accompany the Corelle Dinnerware line of the same name. Released to the public in July 1983 this floral pattern was either white on a blue background or blue on a white background. The exception to this is the release of a clear four-piece Mixing Bowl set in the mid-1980s, which has a white band of daisies circumnavigating the bowl. However, the clear set was called “White Lace” rather than Colonial Mist and had a limited release. As usual, when sold as a set the mixing bowls alternated colors, but the nesting mixing bowls were also released as individual items. 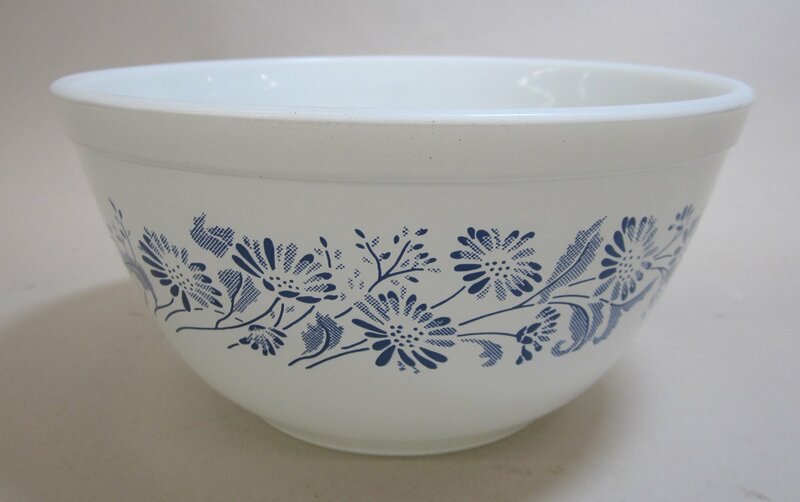 These had a blue background with a white printed pattern, so that the 402 and 404 bowls exist in two forms. By the 1980s the Pyrex dishes were marked with metric units only and Colonial Mist is no exception. As one of the last patterns to be produced on opal Pyrex, Colonial Mist does not include a refrigerator set, oval casseroles, or any ovenware pieces. It was discontinued in 1986 when opal Pyrex was no longer made.